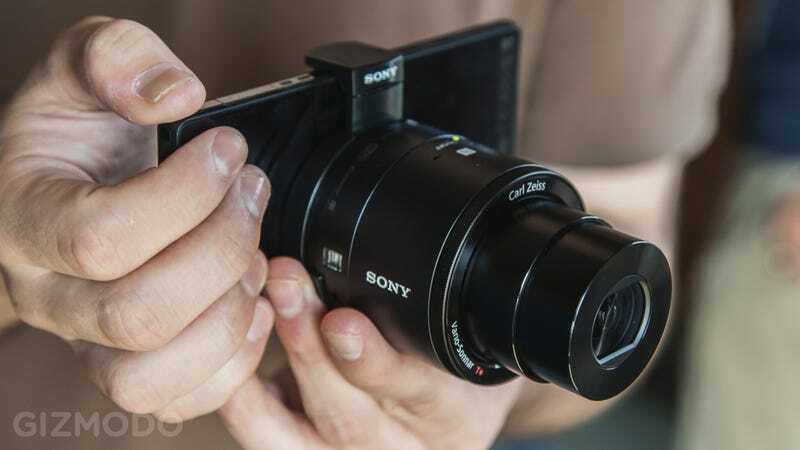 Sony has been doing wonderful things with imaging in recent years, but despite redefining what we can expect from a compact point-and-shoot camera, the company has yet to make a definitive statement in the mobile imaging you do with your smartphone. The QX100 appears to be that statement—and boy is it weird looking. So here's the QX100's formula: Take the impressive guts of last year's RX100 and plug them into a small package that can be carried around like external camera but will also work as seamlessly as possible with your smartphone when you want it to. Forget Nokia's strategy of building a powerful, one-inch sensor camera directly into a smartphone—Sony wants you to carry around one-inch sensor separately so that you can bust it out and Wi-Fi sync it to your phone. On first glance, it sounds a bit complicated. The QX100 is remarkable for its design. When the camera is turned off, it's a 2.25-tall, 2.5-inch diameter cylinder. For reference, that's a bit smaller that a baseball. And though it's being marketed as a smartphone accessory, it's actually possible to use the QX100 on its own: It's got a power button, a shutter release, a little zoom lever, and slot that supports up to a 64 GB microSD card. If you're using the camera entirely on its own, though, you're going to have a very hard time telling what you're pointing it at, and that's where the QX100's mounting bracket and wireless connectivity come in. The camera pairs with any phone running Sony's PlayMemories software over Wi-Fi, which connects easily with an NFC bump, or with slightly more effort if you're using a phone that doesn't have NFC. The app allows you to see what the camera's looking at, take photos and video, as well as to remotely control a limited number of shooting settings directly from your phone. You can also use the app to review and transfer your photos and video to your smart device. PlayMemories is available for both iOS and Android. Using the QX100 isn't entirely intuitive when you first grab it in your palm, and that's why the mounting the giant eye to your smartphone makes sense. Yeah, it feels weird and clumsy at first, and it'll look weird and clumsy no matter what, but it's the only way simultaneously take photos and monitor what you're shooting. The external camera does come with a built-in tripod mount so it's perfectly designed for remote control, but the reality is that for a bulk of applications, mounting the QX100 to your phone will be the best bet. We had the opportunity to briefly play with a pre-production unit, the NFC pairing and Wi-Fi camera monitoring and controls definitely worked—if with a bit of hesitation. As we mentioned before, the QX100's key image sensor and optics are identical to what we saw on last year's RX100: 20.2-megapixel, 1-inch Exmor R sensor on a 3.6x zoom, 28-100mm f/1.8-4.9 Carl Zeiss lens. That means shooting performance should be virtually identical, too. The camera shoots at a standard ISO of 100-3200 for stills. The main exception, and key drawback, is the camera's movie recording mode, which only shoots 1440 x 1080 at 30 fps. Worse, it also only records in MP4 instead of in Sony's higher-quality AVCHD codec. If the QX100 has advanced point-and-shoot guts, the QX10 is the beginner point-and-shoot version. It's a bit smaller than the QX100, and features a much smaller 18.2-megapixel, 1/2.3-inch Exmor R image sensor. The camera features a 10x zoom, 25-250mm (35mm equivalent) f/3.3-5.9 lens. It costs $250, while the QX100 costs $500. Both will be available later this month. So what's the takeaway? The little QX cameras are a new thing, so their real-world utility won't reveal itself without dragging one out and putting it through the paces. What seems certain is that even if they prove themselves worthy of future iterations, what we're looking at is a proof of concept for now.